If you are like me, you worry about security when you travel. As I take many short trips to places like Las Vegas, as well as long trips such as my recent trip to Europe, I always want to make sure that I take as many precautions as possible. Nowadays using hotel WiFi is not costly and poses many security concerns. To help “minimize” this, I use a travel router to “lower” security concerns as well as to allow multiple users to share one connection and share media files. If you have ever look for solutions to help your family stay secure, then you will know there is not much to choose from. You can use one of the subscription VPN services which are typically so slow you can barely stream, not to mention they do not help connect multi-devices to the hotel Wi-Fi. You can use your own router which brings up a new set of challenges. When I go to Vegas I typically need to connect 4 to six devices, so I need to use some kind of router as $24/night per 2 devices can add up. For years I have used different travel routers and for the past 2 years have been using the DIR-510L which was a very nice device. Unfortunately, D-Link did its usual thing and has not supported the device with updates and patches leaving me to look for a more current replacement. Not to go off on a rant, but D-Link is absolutely the worse company I have used for router support and I plan to never buy another D-Link product. I have recently tried 4 different ones in hopes of finding one that works as advertised. Though I am not going to discuss each one, I included a list of devices that I tested along with a quick note on each in the order of preference. What I mainly want to discuss is the one I found to be the best solution, the RavPower Filehub AC750. RavPower Filehub AC750 – Great all-around performance, nice features, share both wired and wireless internet, 2.4 and 5Ghz radios. Can easily handle 4 or more streams to mobile devices. GL.iNet GL-AR750 – Nice features decent interface, mediocre performance, and terrible performance when using the VPN feature. TP-LINK TL-WR902AC – Very basic features, moderate performance. Seemed to work well overall. Lacks current updates. 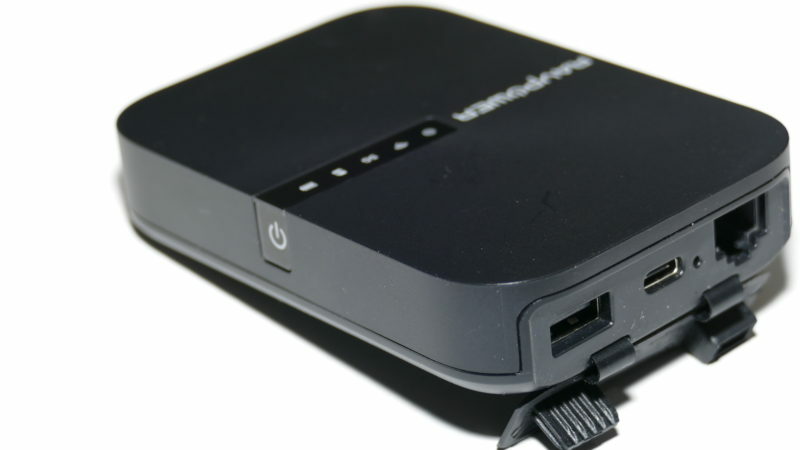 HooToo Tripmate Titan – Works well, great app, great file sharing, only support Wi-Fi N. Not too many recent updates to the firmware. TRENDnet AC750 – Poor overall performance, intermittent Wi-Fi, poor setup. Would recommend not using this device. Setup is very straightforward. As you will see on the video, all you have to do is download the app, power it up, attach your phone/tablet to the device via its WiFi. Once you launch the app you can step through the configuration screens to customize things how you want. I tested the router in a variety of configurations and the most I could get 60 Mbs as a shared connection which I thought was pretty decent. The real test, however, was streaming to multiple devices. Using a 5GHz connection I was comfortably able to stream 4 720P videos to my mobile devices. I saw no buffering or stalling and even scrubbing through a video with multiple devices did not seem to phase it much. I was very impressed with the overall performance in sharing content over several devices from both an SD card as well as a USB flash drive. One caveat though is to make sure the SD card or USB drive you are sharing is fast enough as it will become the bottleneck. These types of devices are not typically something we use every day however when they are needed you want something that you can rely on. Nothing can be more aggravating than going on a trip and not having things work as they are supposed to especially when there are others who are counting on you. With this device, content sharing and streaming to mobile devices are amongst the best I have seen and the configuration and setup are very straightforward. In short, it is hard to not like this device as the cost is around $49 and the performance is very good making it the ideal device to have in your toolbox for both long and short trips, or even a day trip to some friends.